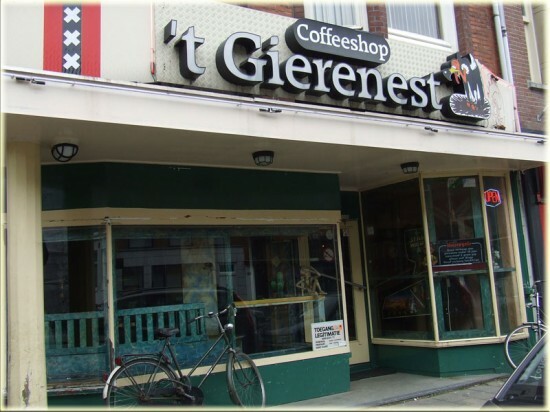 Coffeeshop t gierenest is situated on the Southside of the Vondelpark, on the Amstelveenseweg. The location of this coffeeshop is perfect; the quality of the weed and hash differs too much. Inside there are several possibilities to relax: sofas, TV’s, table football and a nice bar with quality drinks. The problem is that this is only accessible for members. The shop has about 10 different weed and hash product. They vary between the 7 and 18 Euros per gram. This shop is perfect for a nice day in the Vondelpark; because of its location and also because several supermarkets and shops are nearby. You can only pay with cash in this shop; an ATM is a five minute walk. You can reach the shop easily by public transport.